This year I decided to fulfil my promise to myself to run my dogs on snow. I kept my Facebook page up to date with my travels and as such I have received a few messages from the UK9 membership who are also tempted by the calling of snow. I wanted to record the useful bits and retell my itinerary to help get anyone started who fancies giving it a go. My goal is to compete one day on snow or join some kind of distance so I needed to get experience beyond my trips to Scotland and a few cheeky goes round Sherwood over the years. As my dogs are now averaging 6 years old it seemed to be the time to get it done. Chantelle Goddard (also UK9) said she was arranging to travel to La Pesse with her dogs and her team (Brodie and Taylor), and I was lucky enough to meet up with them before the Championship to learn on snow. The first thing to obtain was pet passports and check human passports. The passport systems for dogs may change when we leave the EU, but currently all that’s needed is an up-to-date rabies jab and a full passport with rabies jab which is around £80 per dog. New laws once we leave the EU may mean a blood test a month before and some other bits so double check this. Also dogs must be at least 12 weeks of age to travel and there is a 21 day wait period before being eligible to travel to other EU countries. Next was the pre travel vet check up to weigh the dogs and provide the worming tablets to be given on the return trip by the overseas or race vet. This has to be done between 5 days before return journey but no less than 24 hours and to be stamped in their pet passports to show Customs in UK. For my journey I booked the Dover to Calais ferry late at night (23:20). This was with P&O Ferries costing £270 for a 6.5m motorhome plus 4x dogs. The tunnel is quicker and you can book up to 8 dogs online but it costs £40 per dog each way plus your vehicle. The allowed ratio for travelling with 4 dogs per adult is consistent between ferry and tunnel crossings. I arrived to the ferry terminal early and got waved onto the 22:05 crossing after showing my passport and received a sticker to show I was carrying dogs. While on the ferry, the dogs stay in the van and you go to the passenger deck. The journey takes 1 hour 30 minutes. If you carry a chip list with the dogs’ microchip number it can speed things up if you get checked. Make sure you have European breakdown cover before you go and double check it has full recovery or if unrepairable then will cover the value of your vehicle. It is worth noting that most insurers will not accommodate solar panels, lights, cages and other mushing gear that is worth a small fortune to us. It might be worth considering a policy with hire van for onward travel as it takes weeks for your van to get back and you will want to enjoy your break still! I had a friend who used AA and had full recovery and they were great. I previously broke down in Poland and used a cheap online cover who got us back on the road with a wheel bearing within 2 hours. Inevitably, I broke down on this trip and the RAC tried to be useful when my van failed at La Pesse. Unfortunately they didn’t have a suitable recovery vehicle in the area for hundreds of miles or a nearby mechanic to come out. It turned out to be a dead battery but we had leads and another vehicle so we got my van on the road again. I recommend to get your battery tested before you travel and carry leads it’s going to be a shock to your van, especially if it’s old like mine. Also carry 2x breathalysers, 1x warning triangle, fluorescent vests for each traveller, bulbs and beam adjusters. And don’t forget to inform your insurer of your planned trip abroad. I arrived at La Pesse via a windy road which was treated for snow but it does get covered quite heavily at times. The parking area was just off the road and well used by day visitors and people staying overnight. There is a chalet with two bench seats, a big Belfast sink with hot and cold water and a WC. Standard electric hook-up cable are used with same plug as UK. You need to pay in the local town (10 minute walk) at the Tourist Information to use the trails depending on your duration and discipline (this includes the use of electric hook-up and toilets). I was pleased when I found out that they spoke English. In my case it was 4 days with 4 dogs Sled for 36 EUR and Ski Jour for 28 EUR. The trails were treated on Saturday night and Tuesday during our stay. The trails are hilly with some straights and plenty of turns in a choice of distances – 5km, 8km and 15km. The one restriction is not to use the trails after 18:00. Temperatures ranged from -4 to 8 degrees Celsius. We stayed Sunday to Wednesday and it’s a great place to have a go and learn. The Sunday was busy with local mushers but we had the place to ourselves except one other couple the rest of the time. From the parking you run ¼ km then cross the road before carrying on to 5km of open trails, clearly marked by coloured posts and signs. The trails open and after a short climb you make a long sweeping descent then some long straights passing through open trails and pine trees. Another short climb and further descent before picking up the signs to return to base and back in the shoot to camp after the road crossing. The local town is small so we ventured to Saint Claude (around 40 minutes away) for big stores, a garage and a hypermarket. We found a vet on the Wednesday (5 day window before return travel). Luckily they saw all 4 dogs without an appointment - gave them the wormer tablets, stamped their passports and off we went. This trip could have taken a turn for the worse had I not been joined by amazing UK9 friends who helped my frozen van get going, helped me line out and snub off, plus took great photos and videos to remember forever. And maybe most important, my dogs loved it. The feel of the sled is all about balance and it’s easy to get the hang of. The dogs soon picked up their turns, which is vital, unlike me helping and breaking on turns on dry land. 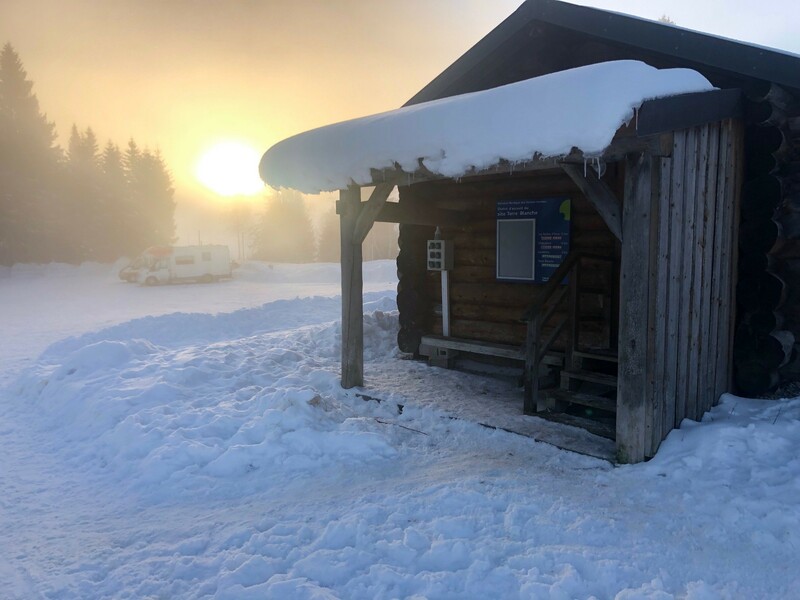 Our journey went on to the World Championship in Bessans where we are now – an amazing Nordic resort which I believe is open to the public outside of the event. So now I’ll hand over to Chantelle of UK9 who is competing here to tell you more - live updates and blog to follow as it happens. I’ve loved my introduction to snow and I’ll be back!! I decided to return a day early and drive straight through as I had experienced some issues with my diesel freezing so wanted a clear day in case I needed recovery. Fortunately my van made it and the weather was clear but as I couldn’t let the van go cold. I left Bessans and the team at 14:30 and covered 650 miles arriving at Calais port at 02:20 after stopping for food and around every 3-4 hours for the dogs to have a wee. Arrival at the port I did not contact P&O in advance and went straight to passport control for France and then UK. This time they took the pet passports and asked me to scan each dog and hand the scanner back to them. I explained I was returning early and was given the option of 02:45 for £60 amendment fee or 04:45 for free. I got my head down front of the queue and boarded at 04:10. We arrived at Dover at 05:15 local time before our last little stop at services and then 4 hours back to Nottingham. The above represents my own experience and opinions on taking dogs to snow. I am happy to help any UK9 members wanting to gain some experience on snow like I did, who want to go on to race with BSSF in the future on snow as there is some criteria before you can represent the club on snow - we are happy to help our members achieve this criteria and another trip could be on the cards for 2020. • Crossing with P&O Ferries from Dover to Calais at 23:20 1x motorhome (6.5m x 2.75m) + 4 dogs £270. • RAC £97 with unlimited repatriation costs. • Vet to sign passport in France £35 for all four dogs around 18 miles from resort. • Kennel cough, booster, rabies if going on race site competing. • Driving miles from Calais around 450 miles ... fuel cost around £150 to La Pesse.